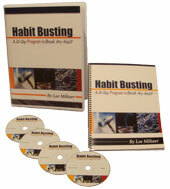 A habit is any action that we have performed so often that it becomes almost an involuntary response. If we consider this habit to be undesirable then we may label it a "bad habit". People spend countless hours and dollars each year attempting to break these bad habits and often do not have any success. Why? Because there is no magic bullet. Change is hard work and there is no short cut to achieving it. The steps a person needs to take, however, can be very simply outlined. 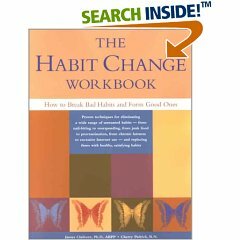 To effect a change in habits, one needs to bring the action back into the realm of consciousness and regain the ability to make choices. Next, take a look at the trade off. What is it that you are losing by exercising your habit? This step should be easier. Just think why it is that you consider it a bad habit in the first place. Yelling at your kids is a bad habit because it leaves everybody feeling tense and tears down your children's self-esteem. You are trading a temporary release of tension for the emotional health of your children. Leaving the dishes undone is a bad habit because your kitchen is a smelly mess. To have more Internet time you are trading off having a pleasant living environment. When you look at it that way it doesn't seem like you are making very wise choices, does it? There has to be a better way. The whole reason you formed your habits in the first place is that they filled a need. You had tension that needed relief or you had a desire to surf the Net. As you break the old patterns you still need a way to fulfill these needs. You will be not only making an active choice to not do the old action you will also be making a choice to perform a better, alternative action in its place. Instead of yelling at your kids you might decide to go for a run every time you are feeling tense. Instead of letting dirty dishes pile up you may decide to use paper plates when you are eating alone. What the new habit is that you substitute isn't so important as whether you feel good about the choices you have made. After all, the reason you consider it a bad habit is because it leaves you feeling bad about yourself. Decide how serious you are about breaking the habit. In addition to a strong commitment, you'll need time and energy to pay attention to your behavior so that you can change it. Keep track of when you do the behavior. Keep a notepad or journal handy. Write down when it happens (what is the situation) and what you were thinking and feeling. Writing increases your awareness of when and why you have this habit. Read and think about what you write down. What does this habit do for you? Is it a way to deal with feelings of boredom, anxiety, stress, anger? Think of what you could do instead of the habit that would be a more positive way to deal with the feelings or situation. Write down some simple alternative behaviors that you could do instead. Pick one you want to practice. Try to catch yourself when you find yourself doing the habit and stop yourself as soon as you can. Start the alternative behavior you decided you wanted to do instead. Aim to do this once a week and increase the number of times per week over time. The more you practice a new behavior, the more it becomes the new habit. Get support from others by letting them know you are working on the habit and telling them what they can do to help. � Be patient with yourself. Habits are so automatic and unconscious we don't realize we are doing it until we are already doing it! � Be kind to yourself. Beating yourself up is another bad habit to be broken.